The last two days have been a roller coaster for me. I’m currently sitting on the couch in my old house in California as I type this. I miss my old home so much, but am so grateful for the new life I’ve been given this past year in Colorado. I was in California this weekend to visit friends and facilitate a values-based leadership conference for sorority women on Friday and Saturday at Cal Poly Pomona. Around 10 a.m. on Saturday while I was at the conference, my phone buzzed with a text message. It was from one of my best friends and sorority sisters, Becca, telling me that our friend Jen had passed on after a 20-month battle against Leukemia. I’ll write more about Jen and the legacy she imprinted upon this earth tomorrow in my Tuesday Truths series. For today, I’ll say this: Whenever a 26-year-old who lived life with the greatest grace leaves this world, it hurts. It aches and upsets you and makes you reevaluate a lot of things about the way you are living your life. I moved through Saturday numb. I put on my leader hat and facilitated the conference even though all I wanted to do was run outside and cry. Or get back on the airplane and hug my friends in Denver. On Sunday, I drove from Los Angeles to Orange County, picked up my old roommate Alex and headed to the most cathartic place I know, Laguna Beach. There’s this little store down there, Tuvalu, that as strange as it sounds, is one of the most serene places I know. It’s filled floor to ceiling with chandeliers, blue and sea foam green glasses to decorate a beach house with and these really inspiring barn wood signs. I worked my way through the store, picking up items, rolling them around in my hands and putting them down. When I reached the back of the store, I saw something that caught my eyes. And then I stood there for what had to have been at least a minute, looking up at it and thinking. It’s so cliché, but this day that you have been given is the greatest gift that you ever could be given. The possibilities for it are only limited by you. In other words, they are limitless. What are you doing with this day? 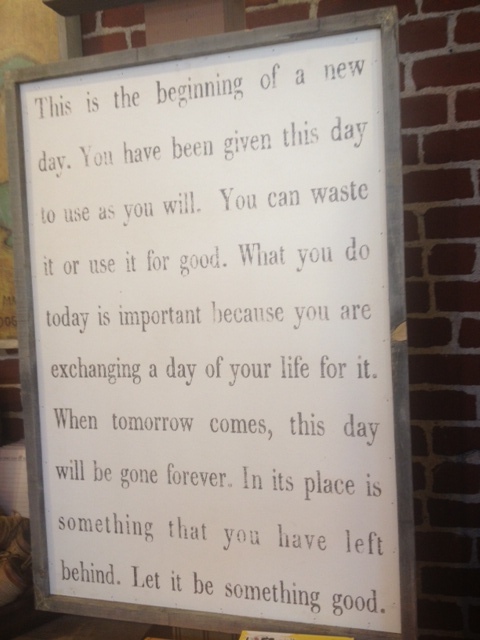 I love the line in this sign that reads, “What you do today is important because you are exchanging a day of your life for it.” How powerful is that? What if we started treating days like currency, where you had to spend them purposefully? What if each of our actions was chosen specifically and intentionally to utilize this one precious day that we have been given? What difference could that make? Today I have very simple advice for you: Make the most out of today. Choose people, ideas and experiences that allow you to flourish. Choose events, instances and occurrences that when you get into bed, your face has no other choice but to fall asleep smiling. Choose to cut riff-raff people, negative feelings and moments of doubt out of your days. Choose to live life purposefully, intentionally and excitedly. Tell yourself that you can achieve your goal. Then get to work on achieving it. Tell yourself that you deserve to be surrounded by positive people who love you. Then get to work cutting the negative people out of your life and celebrating the friendship of the great people who surround you. Make a list of every adventure you want to experience in life. Know no limits in writing it. Actively engage yourself in completing the list. Smile at a stranger. Ask somebody how their day was. Give something to someone who can never repay you. Be actively present with the people who surround you at any given moment. Put away the iPhone. Get off of Facebook. Be in the moment. Push yourself. Run that extra mile. Take that dare. Tell that boy how you really feel. Find grace. Forgive somebody that you don’t want to. Forgive yourself. Take it easier on yourself. Give someone a chance. Get in the car. Pick your favorite station or pop in your favorite CD. Roll down the windows. Put one hand on the wheel and the other outside of the window. And just roll. Think about the greatest joys in your life. Family. Friends. Good food. A nice glass of wine. Incorporate more joy into each day. This is your one day. It’s cliché, simple and perhaps even dramatic, but it is reality. Make the most out of it. Seize it. Tomorrow isn’t promised today. Do everything else that those great philosophers told us to do long ago. Most of all though, make it yours.